Nudge app users with rich, personalized push notifications and bring them back to your app. Deploy lifecycle email campaigns to re-target, on-board, activate, and bring back un-installed users. Rich, native-looking messages that allow you to target users with content relevant to where they are in the app. 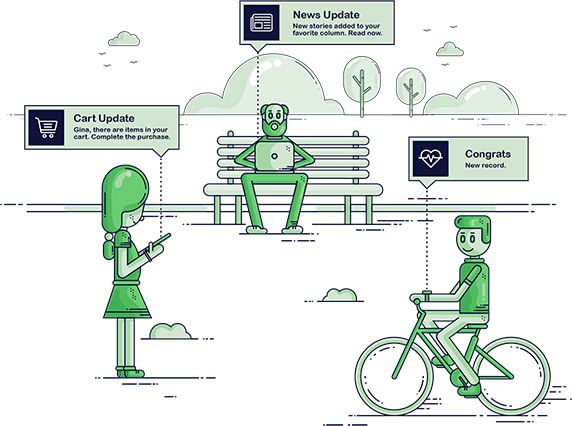 Triggered, real-time & personalized web push notifications to engage website users - even when they are not on your site. On-site Messaging: Personalize product recommendations, offers, and discount codes for your website visitors via pop-ups and banners and convert them into paying customers. Keep users updated about important and time-critical information, which they might miss-out on otherwise. Integrate your broad marketing strategies with mobile marketing automation via APIs and custom data support. Let our product experts explain how you can achieve better ROI with us. delivery rate by up to 20%.